We’re busy rebuilding our website from the ground up to make it easy to use, friendly and fun. That may take us a little while, but you should still be able to find what you’re looking for. Here are a few Frequently Asked Questions to help you out. Q: How do I book my lesson with PUSH Kiting? A: For now, please get in touch via our Contact Page, or via our Booking Form if you know what you’re after. Alternatively, call us on 07736052967 to book an appointment. If you’ve already spoken to us, just download this Welcome Pack and follow the instructions! Simple! Q: What if I can’t decide what lesson type I need? A: Give us a call! Even if you are unsure, we’re always very happy to talk about kiting! Q: When does your season end, do you teach kitesurfing and kite sports through the winter? A: Our season doesn’t end! not until the world does anyway, we just keep on going! Now depending on your level, we may suggest different learning paths for you to avoid hypothermia if it’s snowing outside and you’re after a day 1 kitesurfing lesson so you’d be floundering in the water just getting very cold and not learning much. Instead, we’ll get dry land-based lessons to get you started and up to scratch, teach you all the skills you need to have a proper go at kitesurfing, then when you feel you are ready, in we jump with the Christmas jumpers and all! Do you remember the “Beast from the east”, here’s a photo of our lesson that day with the -6 degree’s wind chill! Q: Is everything supplied for my Kitesurfing, Kiteboarding lesson? A: Yes, everything you need for all kite sports lessons is supplied. Q: What happens if the Kitesurf lesson is canceled due to bad weather? A: Don’t worry, this is factored in, we Reschedule your kitesurfing course at no extra cost! Q: I have a voucher, is it possible to get a refund? 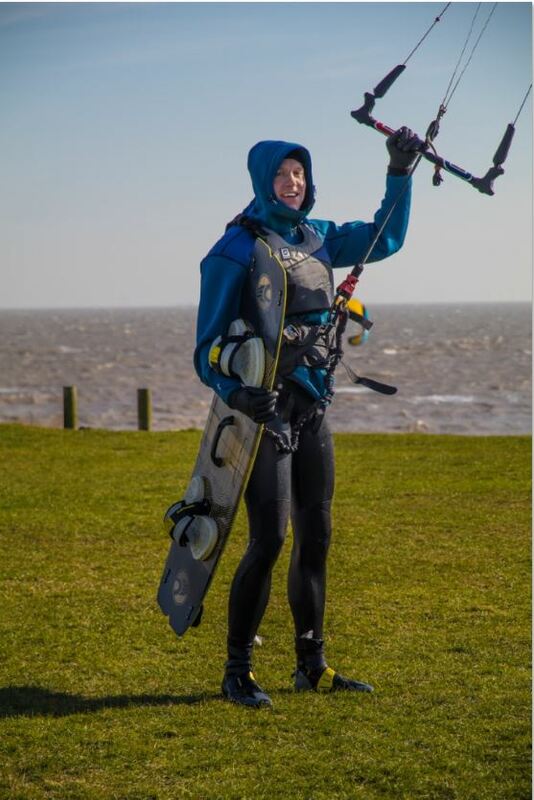 Q: Where will we be Kitesurfing in Essex? A: We run most of our Kitesurfing, Kiteboarding lessons at Clacton on Sea in Essex, just 1 Hrs drive from London, however some of our Kitesurfing lessons will be run from a boat off the coast of Frinton or St Osyth. Land-based or beginner lessons are held at alternate locations again, and all locations may vary due to wind on each day, we try to be as flexible as possible providing you with the best conditions! Always check with us prior to each lesson for exact location! Q: What do I need to bring to my Kitesurfing, Kiteboarding lessons? A: Sunglasses, Sun cream, weatherproof clothes, swimsuit (if you are borrowing a wetsuit), Pack lunch/ refreshments and snacks, a few pounds for parking. Q: When will my kitesurfing, kiteboarding lesson begin? A: This depends on what day we run the kitesurfing lesson, and may need to be altered slightly due to weather conditions so make sure to check a few days before, call us before each lesson to confirm exact times and location! Q: I need to cancel/postpone my lesson? A: We can postpone lessons if we have enough notice, we request a minimum 14 days notification, without this notice we wouldn’t be able to refund a lesson. This is due to the fact our lessons have low numbers of students and while your lesson is booked we are actively rejecting new bookings on that date. Q: Is set up and pack down of kites and equipment part of the lesson? A: Yes set up and pack down of all equipment is included in the lesson time, after all, you will need to set up and pack down kites etc when you are practicing on your own, we are training you to be safe and independent kiters so these are essential skills to learn. In boat courses, it will also include getting the boat in the water as we cannot leave it in the water on its own at the locations where we teach due to safety however this time is fairly minimal as you will be occupied setting up equipment while one of the instructors is doing this. Q: Why do you take a deposit and can I get a refund? A: So you have a great lesson and we can guarantee you have an instructor. It also ensures we can pay our instructors in the event of a late cancellation, as well as covering the admin involved and equipment we need to reserve for you. The deposit is non-refundable, however, we will offer you course credit if we have to cancel due to reasons such as adverse weather conditions. Which are valid for a year from the date of the canceled lesson.